This is open to any student without auditions. Projects include the Carol services, Shows and Competitions. An Irish Trad instrumental group has been set up on Tuesdays. Anyone who plays a traditional Irish instrument is welcome to join. Music Generation is back with tuition in Guitar , Bass, Drums , Flute, Clarinet and Saxophone during the school day on Tuesdays & Wednesdays. If you would like to be part of it please contact Ms.C McEntee. 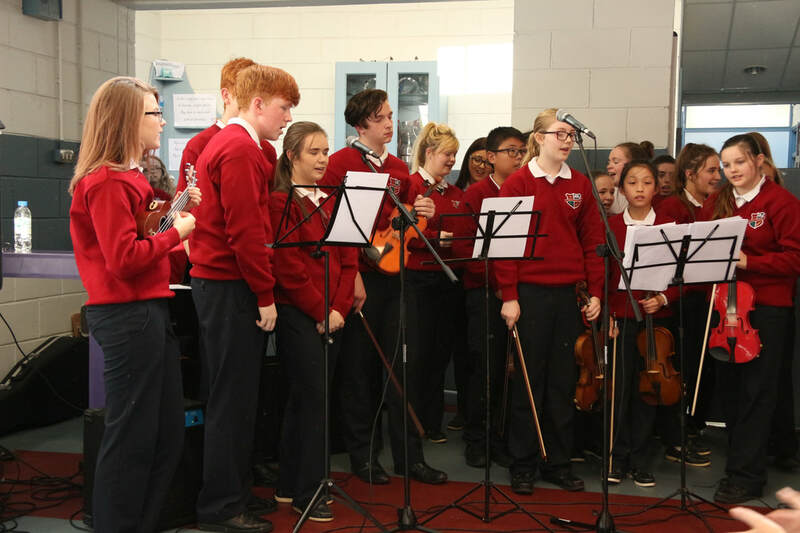 WHAT IS MUSIC GENERATION?Music Generation is Ireland’s National Music Education Programme that transforms the lives of children and young people through access to high quality performance music education in their locality. Through partnership, we create rich and diverse ways for participants to engage in vocal and instrumental tuition delivered by skilled professional musicians, across all musical genres and styles. Music students will be visiting London’s West End in February to see ‘School of Rock’ and some tourist activities. This is our ninth year to visit the West End and the students are really looking forward to it.